Alexandra Kleeman’s debut novel You Too Can Have a Body Like Mine has attracted widespread positive attention. 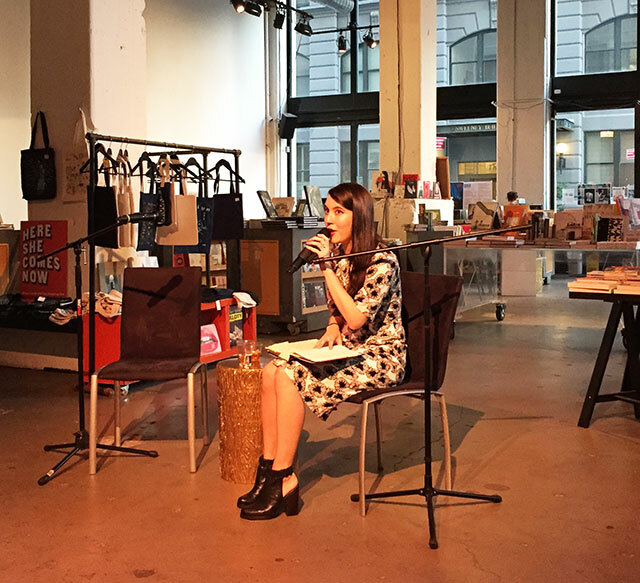 The launch of the novel at PowerHouse Arena was a virtual who’s who of young literary Brooklyn with the audience including many of the summer’s other popular literary debut novelists. 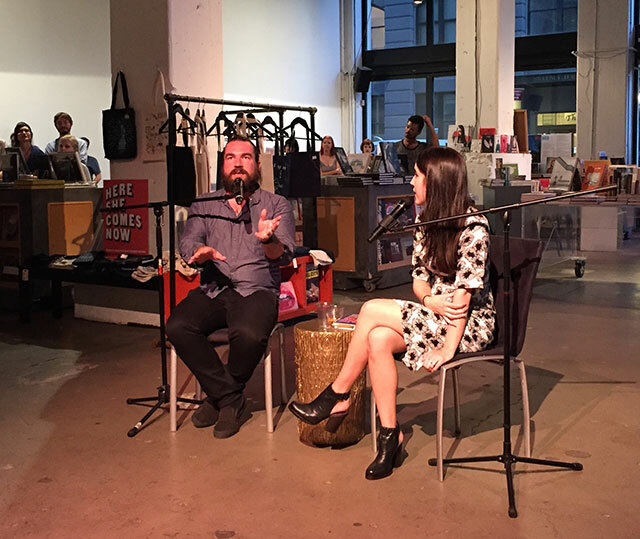 Kleeman was joined in conversation by Buzzfeed Books editor Isaac Fitzgerald. You Too Can Have a Body Like Mine follows three roommates–A, B, and C–as they examine consumer culture and the advertising in a surreal dystopia. Vanity Fair describes the book as “using ‘retro’ to construct ‘modern’,” and listening to Kleeman discuss retro television commercials, the description seems accurate. “It is an incredibly weird book,” Fitzgerald says as a compliment. Food is an important component of the novel, both with regards to A’s interest in avoiding it and artificial foods. The Kandy Kat, a mascot Kleeman invented, (and then later learned was a real snack), haunts the characters. And another character buys out a supermarket’s worth of veal. “I think I’d make a horrible food writer,” Kleeman says. However, she also adds “I’ve always been really interested in food.” As a child, she says that she was really concerned with a plant’s life, and how creating food ended that life. Processed foods always interested her because it meant she could live free of the guilt of killing plants in order to eat. Processed foods do have some negative effects, she says, so a diet of only processed foods might be guilt free, but it isn’t necessarily healthy. That makes eating a choice between the food consumers’ life, and the life of the plants or animals that become food. “Its an ethical issue–what kind of lives am I willing to take to keep myself going?” she asks. The novel is funny. That is an important feature, Kleeman says, because writing it was mostly just her alone in a room with the manuscript. She says she had to entertain herself. Presentation of self is a major theme of the novel, Fitzgerald points out. Makeup and skin care are important to the characters. Fitzgerald understands what these products can do. He spent a week wearing makeup for a Buzzfeed article. Kleeman explains that she discovered makeup as a thirteen or fourteen year old girl, but her her parents thought she was too young for it. There was a lot of sneaking around and applying it before she got to school. But makeup is also something that women have to decide about everyday. They have to choose to put it on. Its all about how others people look at you, Kleeman says, but it doesn’t impact how a person thinks. There have been a lot of female friendship books lately, Kleeman says, and that was another theme that You Too Can Have a Body Like Mine touches on. She cites, for one, Emily Gould’s Friendship, released last year. Kleeman explains that when friends grow towards each other and start acting like each other, they end up giving away part of themselves. Two of her characters end up sharing a lot in common, and that creates a problem between them because inevitably one person feels like they losing themselves. The novel also serves a critique of capitalism, Fitzgerald explains. Advertising is a central part of the book, including the creepy ad campaign of Kandy Kat. Kleeman says there is a moment when the character A finds that she is part of this consumerist machine, and when she steps back, she can see how it is all interconnected, and eventually looking at that, a person might not like what they see. Yet it is impossible to leave behind global capitalism. The cycle of consumer capitalism is seen too in the character of Michael, an activist working to protect calves that become veal. In an effort to stop the distribution, Michael ends up amassing too much to store, leading to the veal’s consumption. Kleeman, who says she had never eating veal before writing the book, says that Michael’s experience is one where even trying to actively leave capitalism is an impossible act. Even for someone trying to step back from the system, the question is where do you step back from? The answer is that consumerism is impossible to escape. The Kandy Kat ad campaign that weaves through novel is a lot like Pac Man, the 1980s arcade game. Pac Man has no agency other than the constant consumption. Kleeman created Kandy Kat with a similar idea of consumption in. She also considered the Kandy Kat was a lot like Trix Rabbit, a mascot for a children’s cereal. Kleeman watched the commercials growing up. The Trix Rabbit is constantly trying to get the children’s cereal through various tricks, but in the end, the children always confiscate the cereal and remind the rabbit that “Trix are for kids.” She says that made her think the world was a really fucked up place. “Trix Rabbit is trapped in a Samuel Beckett nightmare,” she says. She cites an ad campaign involving Trix Rabbit where children and consumers were urged to write in to the cereal company to vote as to whether or not the rabbit would ever get his Trix. He never did, ostensibly because a majority of people voted to deny the rabbit his Trix. “I’m constantly being a consumer,” Kleeman says. Even when you are trying not be one, you end up being one anyway.